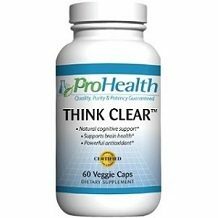 ProHealth Think Clear is the focus of our product review today. 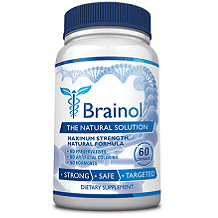 The manufacturer formulated this supplement with specially selected ingredients that it believes can boost blood circulation and therefore oxygen to the brain promoting optimal brain function like focus, concentration, and overall fucntion. Docosahexaenoic Acid (DHA) is an Omega-3 fatty acid and is a major building block of brain tissue. The DHA powder is this product is derived from algae oil. Ginkgo biloba, an antioxidant, enhances circulation and oxygen supply to the brain. Vinpocetine, an extract of the periwinkle plant, enhances blood circulation and the supply of oxygen to the brain. Huperzine A is derived from the club moss Huperzia serrata. It helps to maintain levels of acetylcholine, a brain nutrient that plays an important role in how well your brain functions and overall mental function. there are additional binders, fillers, and chemicals in the capsules. Take one capsule twice a day, preferably with meals. It does not specify if there is a preferred time of day for taking the capsules. Do not take if you are on prescription blood thinners or have a history of heart attacks or strokes. Not for use by pregnant or breastfeeding women. Not intended for those under the age of 18. You can purchase a one-month supply of 60 capsules for $20.49 from the manufacturer’s website. If you sign up for a recurring monthly order the price drops to $16.39 per bottle. Other than this, there are no additional discounts for bulk orders or incentives for new customers. ProHealth offers a 30-day 100% money-back guarantee on any unused capsules. We liked several things about ProHealth Think Clear. It is also competitively priced when compared to other products and it is suitable for vegans. ProHealth offers a 30-day 100% money-back guarantee. The capsules are free from sugar, gluten, yeast or salicylates. The product contains some research proven ingredients that may help your cognitive processing, attention and focus. In this supplement the Docosahexaenoic Acid is sourced from algae oil making it suitable for vegetarians and vegans. If you sign up for a recurring monthly order the price drops to $16.39 per bottle instead of $20.49. We do have some not so positive comments to add however. The guarantee is too short at only 30 days and does not allow the return of opened bottles of capsules. Other than the recurring order discount, there are no additional discounts for bulk orders or incentives for new customers. For all these reasons, we are unable to recommend this supplement as a brain booster. We suggest that you look for one with a longer guarantee, that clearly allows the return of opened bottles of capsules, and offers bulk buying discounts. There is no assurance that the capsules contain non GMO ingredients or that they are made in an FDA certified facility, or that they are free from fillers and binders. For all these reasons we suggest skipping this supplement. Look for a longer guarantee, and better bulk buying discounts.